Today’s farmers have many needs for propane and at Global Propane we understand those needs. We have decades of experience providing propane for a variety of agricultural applications. In fact many of our employee’s are farmers, so we know how important it is to keep your farm running smoothly and efficiently. From grain drying to confinement heating and pest control, non-toxic propane can increase productivity and reduce dependency on chemicals. Farmers can benefit from significant savings by using propane-fueled space heaters and tankless water heaters in their workshops and barns. 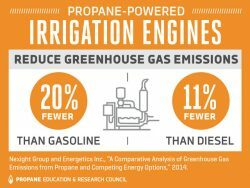 Advanced propane-fueled stationary irrigation engines offer increased efficiency and reliability with reduced maintenance needs. Propane-fueled moisture-control technology reduces the need for chemical application, producing healthier chemical-free crops, easing the harvest process and increasing food safety. Energy costs are always a concern for farmers. With propane-fueled irrigation systems, vehicles, generators and lawn mowers, farmers can keep operations running smoothly and get the job done…for less. Propane-fueled power generation systems produce affordable, reliable and and efficient on-site power. Because of lower fuel and maintenance costs, propane-fueled vehicles cost less to operate than gasoline vehicles. Propane-fueled heat, flame and steam technologies enable farmers to treat for insects before they become a problem to crops and in some cases, a health issue. Insect infestations can damage stored crops reducing quality and making crops unfit for human and animal consumption. Propane-fueled flame and steam are proving to be effective methods for weed control without the use of chemicals. Clean burning, environmentally-friendly propane fuels technologies that can sanitize soil without the use of chemicals. These flame treatments can also reduce pathogens and moisture in the sand bedding of dairy facilities or the floors of poultry houses. Waste management is one of the biggest concerns of livestock operations and other types of agriculture. Propane is an excellent fuel source for technologies that help maintain the proper management and disposal of waste materials. Each year millions of acres of fruit and other crops are at risk to freezing temperatures. Propane is an excellent energy source for orchard heating because of its portability, small environmental footprint and the ability to provide powerful heat.